As I write this review, my father is still in the Intensive Care Unit, recovering from a bad infection. (He’s doing much better today, his vital signs are good and fever down, and should be out of the ICU tomorrow.) I watched the final few episodes of this show when I was waiting to hear what his condition was a few days ago, and it gave me some interesting perspectives on this most emotionally primal of series. It is, after all, about what happens and who you are when your loved ones are taken from you. Mai-Hime Initial Thoughts: Turning Straw into Gold? 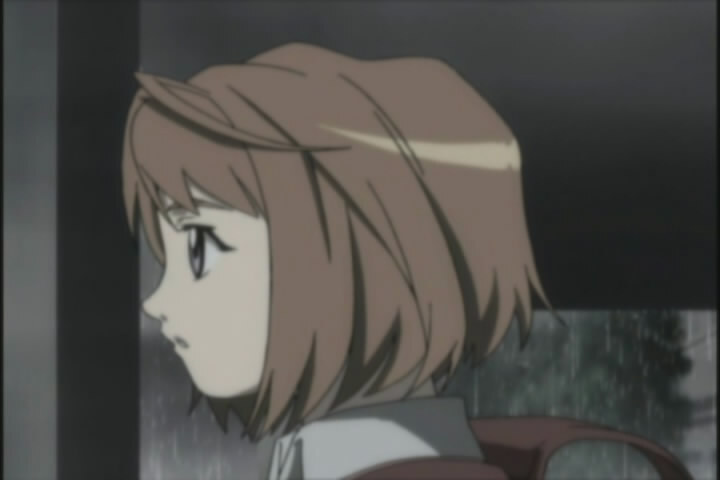 I’ve been away for a while due the impending end of the school quarter, so here’s my first substantial post in a while…and it’s on an older anime, natch. I’m actually watching it on DVD via Netflix, which is not my usual source for anime these days, if you know what I mean. :) This show, of course, has been out for a few years and in my case was barely on my radar until recently–until I heard some strikingly positive reviews from people I trust, and from the Animenfo.com page. What gives? Based on the first 2 DVD volumes I’ve watched so far, I’d say this show was a victim of my genre stereotyping. When I first heard about Mai-Hime, I lumped it together with shows like Shuffle!, Magikano, and other harem/fan-service anime. I’d heard there was quite a bit of fan service plus action, and it simply didn’t interest me. Of course, I couldn’t have been more wrong; even in the first 8 episodes I’ve seen I can plainly detect genuine drama and character development–real heart and substance amid some of the sillier stuff (like the whole character of Mikoto). Mai, in particular, is a very balanced and believable female lead for a show aimed at male otaku. The pieces of a compelling and wrenching conflict are being put into place for her, her friends, and her family, and I am told that it only gets more intense from this point on. The wonderful Yuki Kajiura score (as if it could be any less!) only heightens the mood and lends genuine beauty and pathos to the intense and sad scenes, though the battle music is not quite as compelling as comparable themes in her other work. This has, in short, the makings of a great melodrama, with people forced to make significant choices and to deal with the most primal of emotions. I can’t get enough of that stuff. But this show seems to have another identity. It is definitely a prime example of what my co-writer calls “shori” anime, a show all about and with ostensibly strong female leads but whose target audience is slavering otaku males. Any show that features an entire episode about an underwear-stealing demon and has scenes in the bath where they’re poking and squealing about how soft their bodies are must be. And let’s not even mention the omake sections, which are full of can’t-broadcast-this-level fan service, and the rather bizarre emphasis on close-bordering-on-incestuous siblings (real and imagined). Or an entire school run by a loli, akin to cutesy Testarossa in Full Metal Panic somehow being in charge of an entire military brigade. Granted, a lot of these elements show up more at the beginning of the series, and as of the second DVD, they are fading. My guess is that this is another example of a typical “hook ’em with fan service for the sucker punch of drama.” It may be my changing tastes, but I find this sort of transition to be more and more unnatural as time goes by. I understand that humor helps us empathize with the characters later on and that nobody likes to see unattractive people on screen…but it helps drag down the believability factor which is important for the great drama that the show seems to be promising. I may be nitpicking, though, and I may be confusing it all with the excessive omakes (I think I’ll just skip them from now on). The point of this show seems to be to take the conventions of fairly cliched genres–here, the magical girl and fan servicey school comedy–and to turn that straw into the gold by giving us, well, characters worth caring about who get thrown into very difficult situations. Especially Mai, whose desire to be responsible and caring is both touching and believable, even if it is occasionally expressed in unbelievable ways. (I clearly see that it will lead to heartbreak later on.) In that sense Mai-Hime is a lot like Evangelion, which took the giant robot genre and stuck genuine depression and self-loathing in the middle of it. This is more about love than misanthropy, though, which is refreshing, and these are people whom we actually like as opposed to pity at best. People who haven’t tried writing stories before sometimes don’t realize how hard it is to achieve that, so my hats off to anyone who’s able to take fairly standard anime genre stuff and make it better. Next time: my own mid-season review!